HYDRA is part of the FORTY chiller family, a range created for air conditioning custom-fitted. Includes hydronic monoblocks with the exclusive ADAPTIVE control to manage the operation of the machine without installing the accumulation buffer tank. 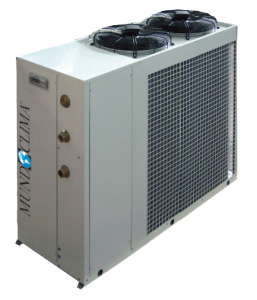 Hydra is an air condensation liquid water chiller for outdoor installation with reversible heat pump. High efficiency, adequate dimensions for domestic and commercial usage. The Adaptive function optimizes compressor power cycling through automatic configuration and dynamic of set point and temperature offsets. The adaptive control optimizes consumption and compressor performance, so that environmental impact is also reduced. The ventilation control optimizes the performance at low temperatures and makes possible to decrease the sound level for residential or private uses. Inlet connection inch 1-1/4" 1-1/4" 1-1/4" 1-1/4" 1-1/4" 1-1/4" 1-1/4"
Outlet connection inch 1-1/4" 1-1/4" 1-1/4" 1-1/4" 1-1/4" 1-1/4" 1-1/4"
outside temp. (7°C – 85% HR) for the thermal power. LpA measured at 10 meters in open field. Minimum water content for installing 4 1 / Kw.